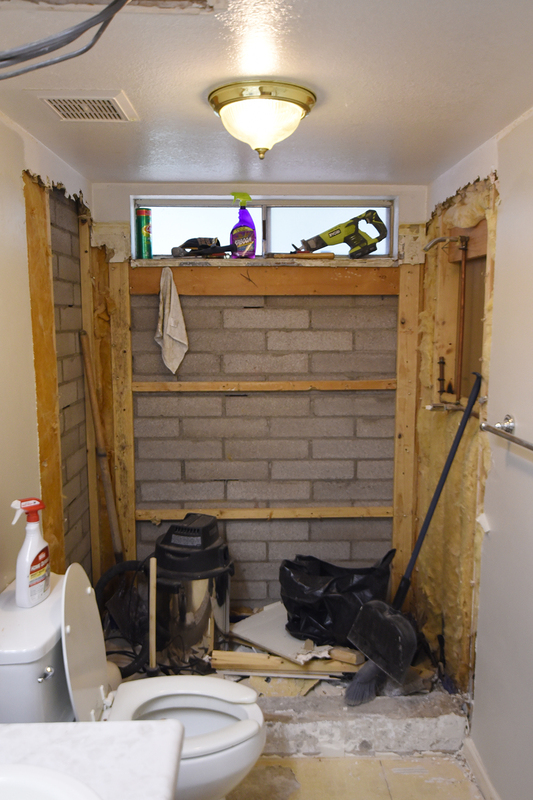 We Demolished Our Master Bath Right Before Christmas - Real life, on purpose. Because the holiday season is the perfect time for a remodel, right? What, you don’t want this kind of mess in one corner of your house while trying to keep things festive everywhere else? We had originally planned to knock this out before the holidays, but David wound up traveling for work through a good chunk of both October and November. Home renovations took a back seat to…pretty much everything else. 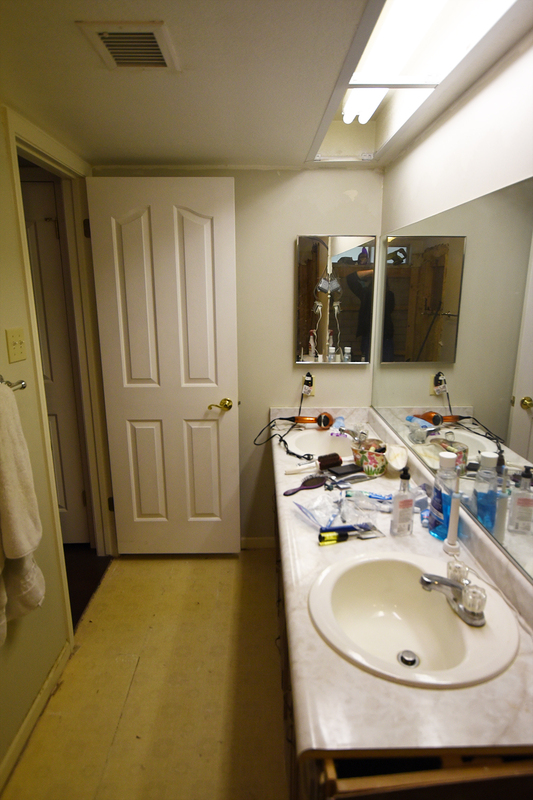 Then he was home AND had to use a bunch of his PTO over the holidays, so we started taking care of the master bathroom. It’s been 5 1/2 years since we bought this house, and in that time I used the master bathroom shower only once. I think we’re a little overdue for some upgrades, don’t you? As usual, though, it’s taking longer than we originally hoped. Such is usually the case when you do most of the work yourselves. Pros: gigantic mirror and double sinks. The faux marble laminate countertop was scratched and stained and nigh impossible to get clean. Overhead fluorescent lighting does nobody’s complexion any favors. The 1980’s builder’s grade cabinetry was, like the kitchen, both ugly and not very storage space. I couldn’t even fit my round brush in the drawers because they were so shallow! The floor you see here is the original laminate, which some previous owner had tiled over with the same beige stuff in the rest of the house. It’s not exactly pretty but it was in good shape. However, since we tore the entire room down to studs, we figured we’d replace the flooring too. Why try to work with what’s there if you don’t like it that much anyway? 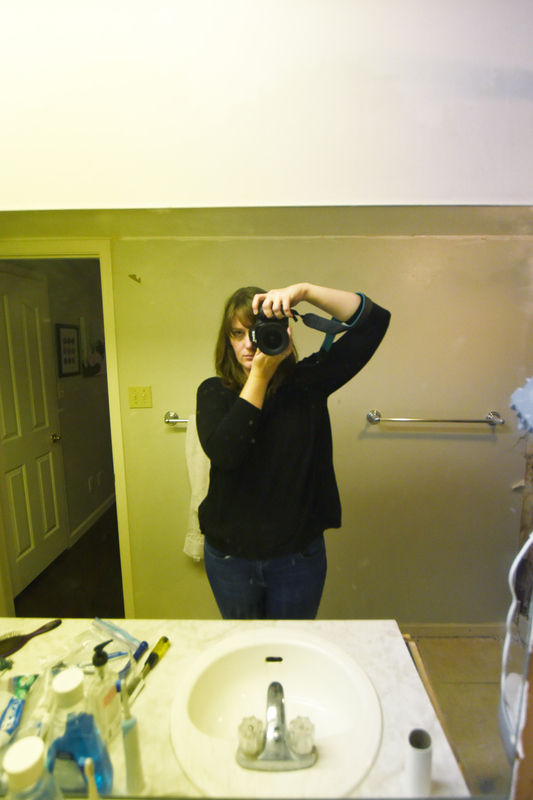 It’s hard to tell because I used a wide angle lens so it’s all distorted, but look at where the counter hits my legs. It barely came to mid-thigh on me. And yes, I’m tall, but come on. WHAT IS THIS, A BATHROOM FOR ANTS? To make it worse, the mirror was just barely as tall as me (six feet) which means David had to hunch down to see the top of his head. The ceiling, again like the kitchen, was dropped. While most of our house has standard 8 foot ceilings, the bathrooms are only 7. And again, we are tall people. It felt like a cave in there. That feeling was not helped by the pony wall between the vanity and toilet, which unfortunately was already torn out when I took these photos. Lucky for you, I am a master at photoshop. Nice, right? Before AND after. I hated that wall. I mean, it was nice to have a second medicine cabinet on that side of the vanity, but it made a small room feel even smaller. It’s not like it provided any privacy for someone on the toilet. In fact, it actually crowded the toilet and put the toilet paper roll uncomfortably close to your elbow, which, if you’re wondering, is less than ideal placement. So I’m sure you’re wondering a) why the heck did we live like this for so long and b) what’s it going to look like when it’s done? To answer the first question: dollars and priorities. The kitchen was number one, and it was a major expense. Then there were babies and smaller projects to attend to. Now we’ve squirreled away some cash and are staring down the barrel of three potty-trained children. If we didn’t want to share their (also gross) bathroom forever, the time was right to do this thing. To answer the second question: I’m not entirely sure since we still have some decisions to make, but I can give you a preview! Every time I peek in that door, my heart goes thumpety-thump. It’s so pretty. I want to rub my face on all that glorious subway tile. We tore out the ceiling and bumped it up a full foot. 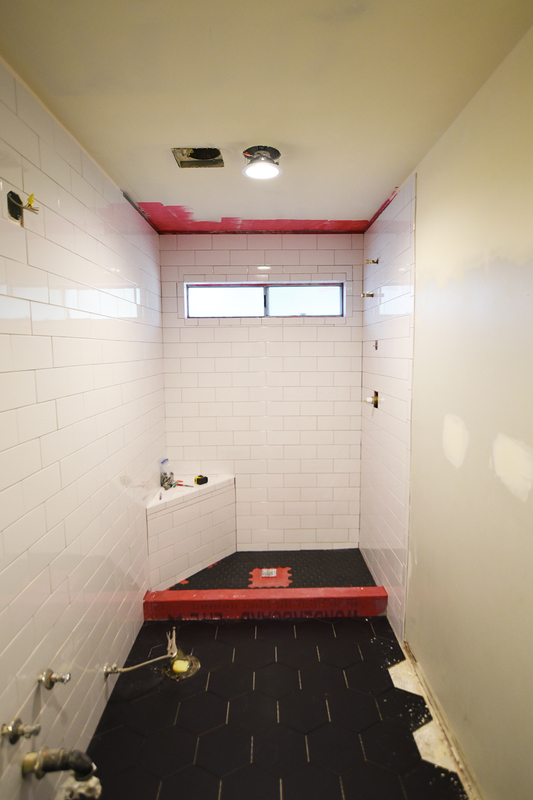 David installed some recessed lighting, built a bench in the corner of the shower, and we hired out the drywall. He has done most of the tile. I’ve helped a little. We still need to finish the edges of the floor, do the shower floor, and grout everything. Oh, and paint. Obviously. In addition to the black + white tile, we’re planning on rectangular white vessel sinks, simple brushed nickel fixtures, a wood countertop identical to the one in our kitchen (but sealed + waterproofed), a glass shower wall/door, basic black-framed mirrors, and some really pretty light fixtures. There are still details to work out, but it’s coming together nicely so far. And after 5 1/2 years of using the fishy bathroom shower and a month of sharing a toilet with a 4-year-old whose bladder is the size of a peanut, I am READY FOR IT. Makeover Makeover: Fireplace Edition Day 10: Closet Space I Have a Work Nook! We started our kitchen renovation over the holiday break too and it is still going. Crossing my fingers that it’s done by next week. Oh and I’ve only used my master shower once the entire time we’ve lived here as well. It was made into a handicap accessible shower for the past owner so there are bars and handles everywhere and the shower head is horrible. One day we might get to that. Anyways, love the floor to ceiling subway tile! Can’t wait to see the finished product. What is with these old houses being SO WEIRD? Here’s hoping we both get our remodels done quickly and (mostly) painlessly! This is so great.. so far! would love to see the outcome of this! Hey Jen, I am a fan of your writing. I have a thought to share with you. Pour a bottle of cola into the bowl ensuring that you coat all area with the liquid. Let soak for a couple of hours and wipe off. Not sure if it works on hard water stains but it removed the unidentified stains from my toilet bowl. Wow, Looks awesome so far. Great job. Anyways, love the floor to ceiling subway tile! Can’t wait to see the finished product.